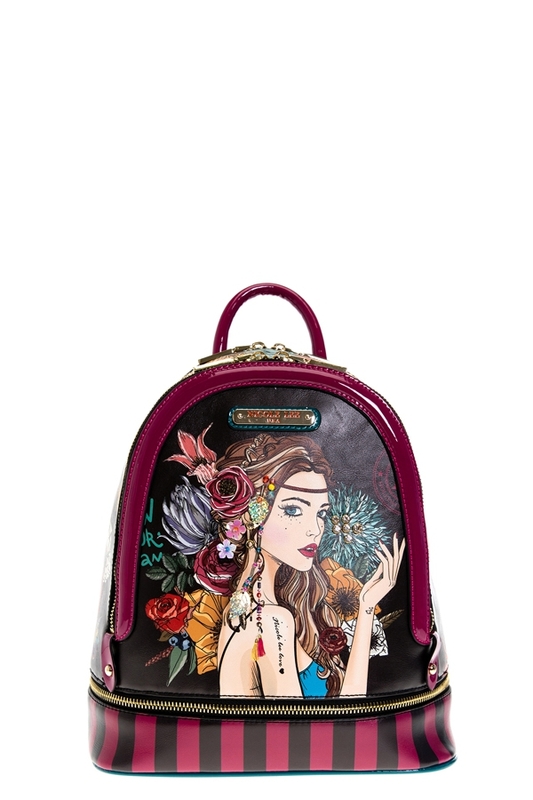 What could be cuter than the fun and stylish look of the Bohemian Print Backpack. Exterior Features: "Angelina Follows Dreams" exclusive print. Made of vegan leather. Metal zipper closure with NL monogrammed zipper pull. Top handle. Zip wall pocket at back. Adjustable backpack straps. Structured silhouette and NL nameplate at back. Interior Features: Two zip compartments with zip wall pocket with NL nameplate at back, double open wall pockets at front, vegan leather key chain strap and NL polka dot logo nylon lining. Vegan leather handle with 3.5" inch drop. Adjustable 20" - 36" inch shoulder strap.